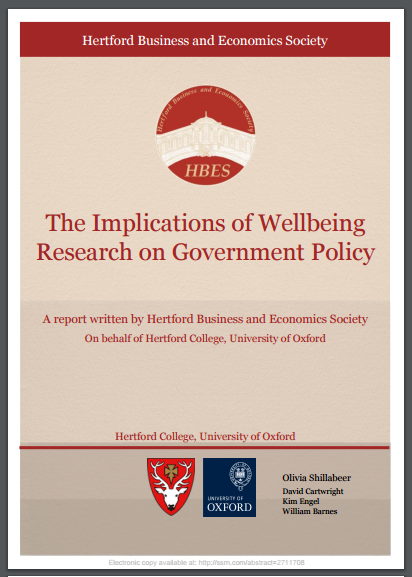 The Hertford Business & Economics Society, an undergraduate group at the University of Oxford, recently completed a research project looking at wellbeing and government policy. The final report was presented to the Cabinet Office in December 2015. Here, Kim Engel, one of the co-authors of the report introduces its three main proposals. Ideally governments would carry out controlled experiments to assess the wellbeing impact of every plausible policy. The most cost-effective policies would be implemented. Then further experimentation would be used to refine those policies. But in reality experiments require scarce resources like money, time and expertise. And there are still large methodological controversies surrounding the quantitative measurement of wellbeing. This leaves room for organisations such as the Civil Service to adopt other approaches to improving wellbeing. 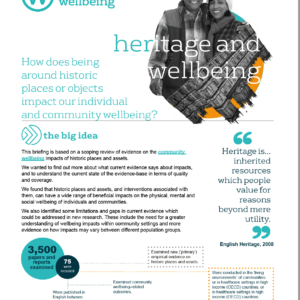 We proposed the use of a brief, one-page “wellbeing table” for making speedy estimates of wellbeing impact. The table would provide space to describe the probable effects of a policy on key determinants of wellbeing such as employment and mental health. 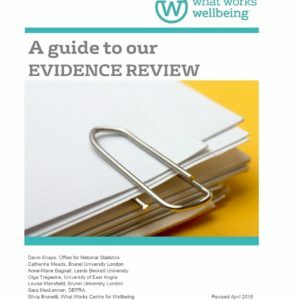 It would come attached to a one-page “information table” highlighting the main conclusions of existing academic research into factors affecting wellbeing. A study involving more than 17,000 Britons found that “the most powerful childhood predictor of adult life-satisfaction is [a] child’s emotional health” (Layard et al., 2013). Yet schools currently have limited incentive to prioritise wellbeing. OFSTED assessments cram “Welfare, personal development and behaviour” into one section out of a total of four. We suggested that a new section on “Pupil Wellbeing” could be introduced to OFSTED reports to give schools credit for adopting proven methods of improving wellbeing such as social and learning (SEL) programmes, healthy eating measures, and the provision of good counselling services. Universities can also make a big difference to wellbeing in the UK. Above all they must address massive increases in the number of students with mental health problems. HEFCE statistics published in 2015 show a 125% increase in the number of students with mental health problems in the four years to 2012-13, while many universities are reporting double-digit annual growth in demand for counselling services. We therefore proposed that the National Student Survey (NSS), taken by more than 300,000 students annually, should include a question about satisfaction with university mental health services. This would generate valuable information for prospective students, and give universities strong incentives to up their game. We also mention the further possibility of adding the “ONS4” wellbeing questions to the NSS. 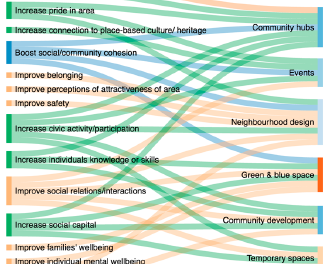 By providing a snapshot of wellbeing at every UK university, this would help researchers and universities figure out “what works” for wellbeing. Businesses can take a variety of evidence-based actions to improve employee wellbeing. These include improving work-life balance, promoting good health, helping employees take greater control over their work, and developing employee’s sense of the social value of their work (New Economics Foundation, 2014). Companies that succeed are likely to enjoy a boost in profits as productivity rises and absenteeism and employee turnover decline, raising economic growth and making everyone better off. We proposed that the government should mandate large firms to produce an annual report on employee wellbeing. The reports might explain how wellbeing policies are adding value to the firm and disclose expenditure on non-financial wellbeing (e.g. social activities, counselling, physical health programmes). They would alert shareholders, employees and the media to underspending or under-performance on employee wellbeing. Firms would therefore have additional incentive to invest in employee wellbeing. Jeffrey, K., Abdallah, S., Michaelson, J. (2014). Wellbeing at work. New Economics Foundation. Layard, R., Clark, A. E., Cornaglia, F., Powdthavee, N., Vernoit, F. (2013). What Predicts A Successful Life? A Life-Course Model of Well-Being. Discussion Paper No 1245. Centre for Economic Performance, LSE. NextGuest blog: What Makes a Good Childhood?